taken root (think Napa Valley, CA or Fredericksburg, TX in their early days). hosts at their scenic wineries. For Reservations, CLICK HERE. 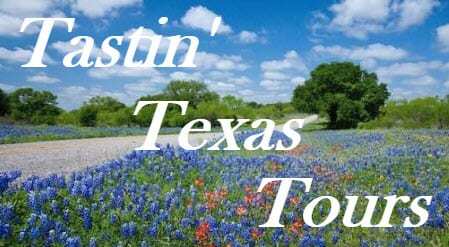 are selected by Tastin’ Texas Tours (3 or 4 wineries). Includes snack, water and tasting fees. of this interesting and scenic part of Texas. For Reservations, CLICK HERE. 14. Larger groups may be accommodated with advanced notice. visit, or we help design a tour based on you desires or the occasion. Group up to 6. Box lunches or winery snack plates are available for all tours, at guest’s request. A stop at a local restaurant may also be arranged for Mixed Tours. Contact us for more information about all of our tours, services and upcoming events.